A colour can say so much about an interior space. It can also give so much: it can breathe fresh life into a room where there was no life before, or add personality and new verve to a space that may have lacked it otherwise. Colour is one of the most versatile and accessible tools in the interior design book, and so too is its absence. While the inclusion of bold reds, vivid yellows, dreamy blues and everything in between might be an appealing addition to some homes, not all will respond well to this sort of treatment. Sometimes, a sheer, well-appointed lack of colour can be just as striking a design solution: brilliant whites and light cream tones, for that classic, uncompromisingly elegant aesthetic. But the question remains: how to do this, and do it well? 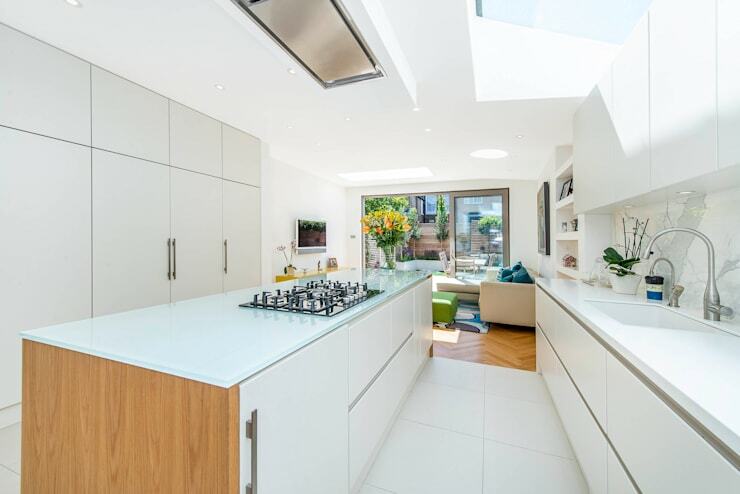 Today on homify, we're taking a look at some fantastic examples where an all-white interior was exactly what was needed. As we always say, simple is almost always the best policy, and white is one of the most classic, simple additions to any modern home. Read on, get inspired and consider employing some fresh white tones to your interior spaces today. All white can work wonders in large, minimalist rooms such as this fabulous open plan kitchen, dining and living space in one. Here, we see just how well an all-white motif enhances the natural airiness and breathability of a home interior: a clean, light, classic hue for the walls and ceiling, amply illuminated by the natural light streaming in from the side windows, the ceiling halogen from above, and the gorgeous chrome downlights over the elegant wooden dining table. 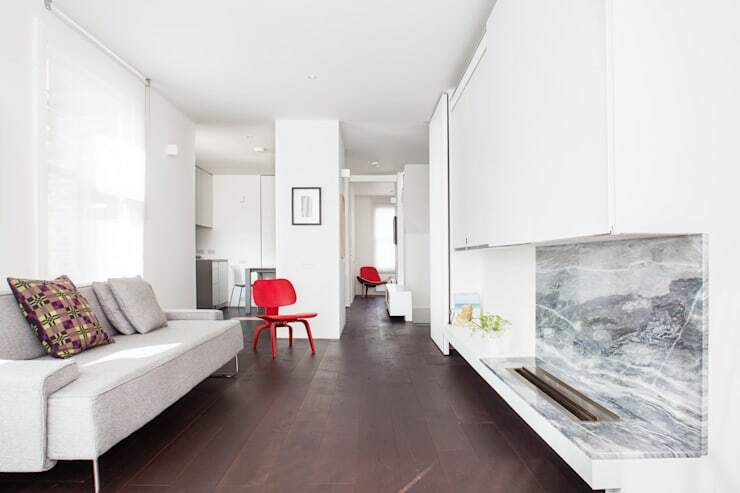 For a sleek and chic contemporary setting, all-white makes the most sense, especially when paired with matching cabinetry and hardware, not to mention gorgeous light-toned wooden floorboards. Smart, inviting and aesthetically fabulous. Of course, it can always be a bit of a daunting task when remodeling your home spaces, especially when changing up the tones and hues of the walls and ceiling. For a little advice, why not chat to a professional to get you started? The beauty of using a 'carte blanche' colour like white, cream and bone is that you can do so much with it. Whereas bright, lively colours can bring instant design statements and bursts of energy to a space, white is much more versatile, opting for a more demure, balanced, modest statement that allows you to work with it in some many different ways. From a stylistic perspective, white is conducive to so many different aesthetics and directions: sure, it works well in a classic, elegant sense, but it can be employed to create all sorts of different shades of style. 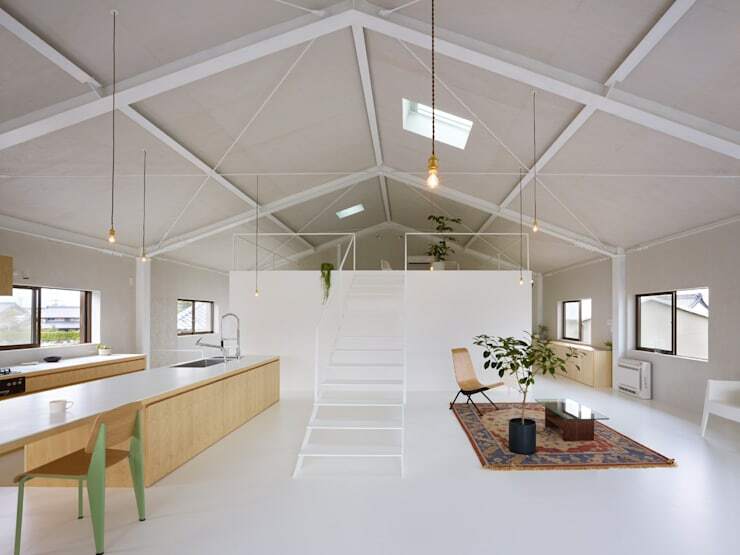 Take this example here as a fine display of what's possible: an all white loft, with beams and ceiling replete in light tones, matched artfully with all-white flooring and feature bedroom loft as the room's centerpiece and central divider. This is eclectic modern design at its best, and its success relies on the decision to use a brilliant, versatile white motif from top to toe. Just as modern and eclectic design can benefit from a splash of all-white paint and treatment, white can be used just as well to induce a more traditional contemporary aesthetic. Here, we see how it's done: a brilliant all-white kitchen, painted from ceiling to wall, matched with a delightful floating island storage and preparation space, and gloss-white cabinetry. But as much as the all-white interior, it's the addition of juxtaposing elements that enhances this space and makes it succeed from a design point of view: white-toned floorboards to induce a sense of traditional allure, as well as the balance of rustic timber dining table as a point of reference, and the modern down lamps for a little modern flourish. Balanced, bright and brilliant. We often talk a lot here at homify about the virtues of minimalism: sleek, clean lines, embedded in a certain Zen-like spaciousness and clutter-free aesthetic, and indeed, minimalism can work wonders in the home for both aesthetic and functional purposes. However, sometimes its stylistic opposite can, in the right circumstance and setting, also work to fabulous effect. Maximalism can really make a home interior look fabulous, especially where a 'more is more' aesthetic is demanded. Here, we see a delightfully appointed living room that has opted for a more maximalist touch over a minimalist one: accessories, lights and fittings, bold windows with soaring urban views, and the addition of magnificent contemporary art. The white here works to fabulous effect, with floors, walls and ceiling providing the canvas foundation for the rest of the space and its accoutrement and furnishing. All-white, lavish and highly livable. When it comes to employing an all-white aesthetic to your home, we use the term 'all-white' liberally. While the bulk of the interior area ought to be appointed with a distinct white aesthetic, that doesn't mean absolutely all of it has to. Sometimes, all-white works best when it's accompanied by striking juxtapositions and contrasting elements. Here, we see how, with the inclusion of stunningly characterful flooring, an all-white interior living space can be given a distinct rustic flavour as well as a sleek, contemporary one. Striking, red modern sitting chairs given the space even more stylistic depth, contrasting the different stylistic elements tastefully, and masterfully. Last, but not least, one of the most desirable virtues of using all-white for your home interiors is the way it captures, illuminates and emboldens natural light. For bright spaces like the kitchen and living room, white truly works wonders and can turn your space from a well-lit one into a dazzlingly vibrant, naturally-lit haven. 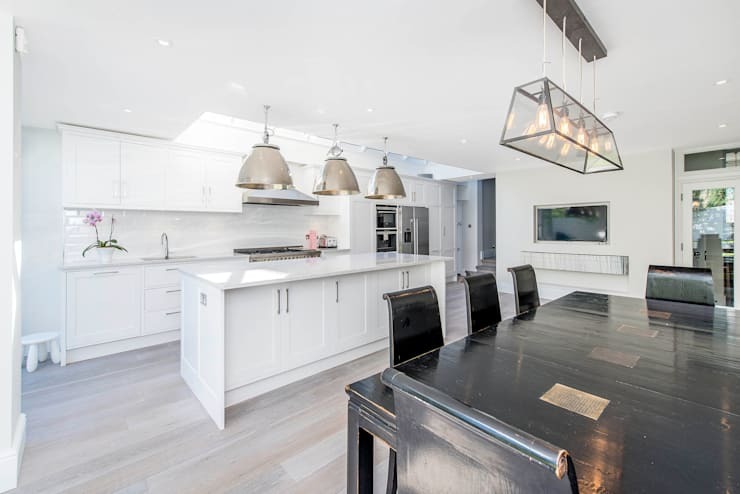 Here, we see how an all-white interior can really enhance a space: a light, bright and highly versatile kitchen, with adjacent living space, appointed beautifully and looking amazing with ample natural light and the infusion of white. Did you like that Ideabook? Why not keep the inspiration flowing with a look at how to Embrace all-in-white interiors? Which all-white interior tip did you love the most? We’d love to hear from you in the comments section below!